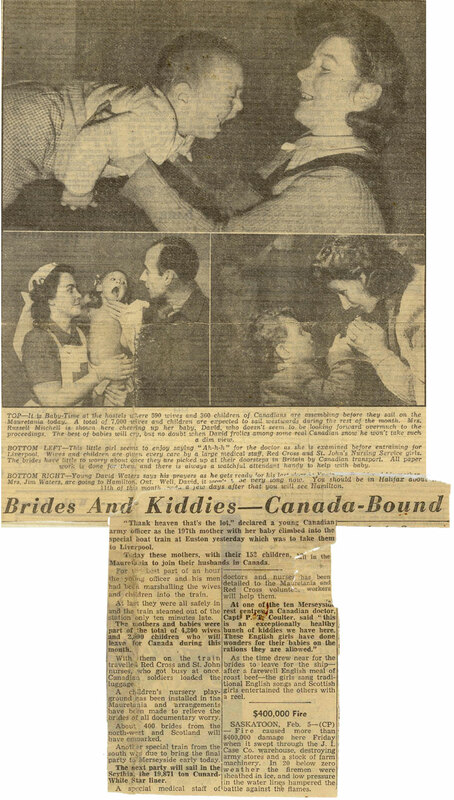 Article Brides and Kiddies - Canada Bound, February 5, 1946 (Source: Sgt. K.M. Hermiston, CWAC Film and Photo Unit). Click to read full article. Interested in articles about specific War Brides? We can find them for you. Click here to read a downloadable version of The History on the War Brides of New Brunswick, Masters Thesis in History by Melynda Jarratt. The story of the Canadian war brides and their journey to Canada is one of the most fascinating and romantic of World War Two. Why nearly 45,000 British and European women would leave behind everything that was familiar to start a new life in post-war Canada is a story worth telling. The war brides came from all over the United Kingdom and from nearly every country on the European continent, but the vast majority (93%) were British - and the reasons are fairly obvious. Canadians were among the first to come to the assistance of Britain after war was declared in 1939 and they spent more time there than any other member of the Allied Forces. In fact, just 43 days after Canadian soldiers arrived in December, 1939, they celebrated the first marriage between a British woman and a Canadian serviceman at Farnborough Church in the Aldershot area. That marriage, and the 48,000 which followed over the next six years, formed part of the most unusual emigrant wave to hit Canada's shores: All women, all of the same generation, and mostly British, these nearly 45,000 war brides are an important part of Canadian history that has gone relatively unnoticed by historians and journalists alike. As a group, the war brides shared many similarities: but far and above the image of a British war bride with her loveable accent and tea cosy, these women represented a diversity of experience that makes them as different from one another as they are to other immigrant groups in the post-war era. But whether they were English, Scottish, Irish, Welsh, Dutch, French, Belgian or Italian, the War Brides have the shared experience of meeting and marrying a Canadian soldier during war time, leaving their home country for a new world by trans-Atlantic ship across the ocean, crossing Canada by war bride train, settling in to their new homes, raising families and adapting to a new culture, language and religion at a time in our history when the future held great promise for new Canadians. This website draws together the various components of the Canadian War Bride story to provide a compelling portrait of the human experience. Love, passion, tragedy and adventure are all part of that story and we hope that you will come away from this site with a greater understanding of this amazing group of Canadian women.